Cochin is a city in southwest India's coastal Kerala state. It has been a port since 1341, when a flood carved out its harbor and opened it to Arab, Chinese and European merchants. Sites reflecting those influences include Fort Kochi, a settlement with tiled colonial bungalows and diverse houses of worship. 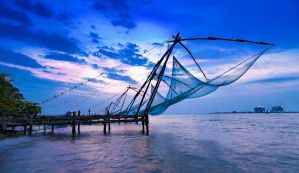 Serene Cochin has been drawing traders, explorers and travelers to its shores for over 600 years. Nowhere else in India could you find such an intriguing mix: giant fishing nets from China, a 400-year-old synagogue, ancient mosques, Portuguese houses and the crumbling remains of the British Raj. The result is an unlikely blend of medieval Portugal, Holland, and an English village grafted onto the tropical Malabar Coast. It's a delightful place to spend some time and nap in some of India's finest homestays and heritage accommodation. Cochin is also a center for Keralan arts and one of the best places to see Kathakali and kalarippayat. Mainland Ernakulam is the hectic transport and cosmopolitan hub of Cochin, while the historical towns of Fort Cochin and Mattancherry, though well-touristed, remain wonderfully atmospheric � thick with the smell of the past. Other islands, including Willingdon and Vypeen, are linked by a network of ferries and bridges. With so much to see and do, Cochin is a great place to visit, and, luckily, there are some great, budget-friendly accommodations to use as a base for exploring. 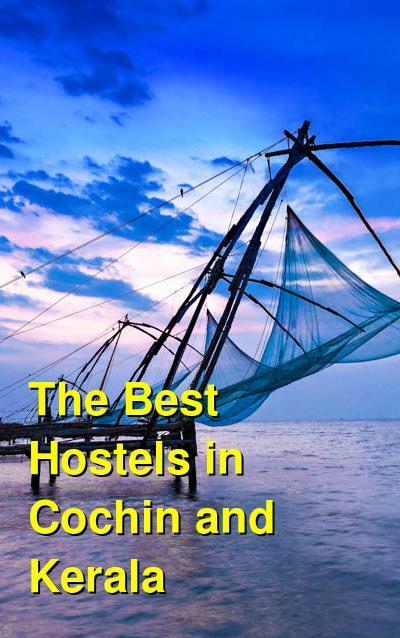 How much do hostels in Cochin cost? If you wish to explore the calm and peaceful town of Cochin, check out Maritime and they will provide you with the essentials for the 21st century explorer: Free wifi and breakfast, fully equipped kitchen, hot water, lockers, and 24/7 security. The lower part of the house is a common meeting ground where you can relax and get to know fellow travelers. The upper balcony gives you a view of the port across on the next island. The property is located just 5 minutes away from the ferry point and the bus station. Maritime is well located to help you explore the Chinese fishing nets, the old churches, or the quaint Jewish part of town. You can also book backwater tours or tickets to traditional Kathakali performances from the reception. Breakfast and linens are included with your stay and towels are available for hire. Tantraa Homestay is located close to the center of Fort Cochin in a very quiet location. It has a homely feeling to make you feel welcome and comfortable. They offer a variety of rooms with air conditioning, TV, internet, and a great rooftop terrace with both sun and shade where you will also find yoga and cooking facilities. The rooftop is also a great place to relax, read, and meet new people. The facility organizes a variety of activities, including: the famous Backwater tour, a visit to the traditional Kathakalicentre (with its dances and martial arts), a trip to the beautiful Munnar, and many more. They can also arrange pickups from the train and bus station as well as sightseeing tours around Fort Cochin. Linens, towels, and parking are free with your stay and bicycles are available for hire. Good Karma is centrally located within 2 minutes' walk of the center of town and local attractions such as the Chinese fishing nets. The hotel has 4 double bedrooms all with private bathroom and small balcony. There is a TV sitting room on the downstairs floor and breakfast is available on request at a small extra cost. The rooms are spotlessly clean, decorated in modern colors with beautiful antique beds. The hosts are more than helpful and speak excellent English, locally born and can advise and book all attractions in the area (such as backwater tours and tea plantation trips.) Airport or train pickup is vehicle also available. Linens are free with your stay. Kadalkkara Lake Resort lying between the pristine Cherai Beach and panoramic Cherai Lake, is the ideal choice for budget travelers. Cherai Beach is famous for its unspoiled stretches of golden sand and shallow water. The cherai lake is a scenic stretch of water. This property is a 6-minute walk from the beach. Featuring free WiFi and a restaurant, Kadalkkara Lake Resort offers accommodations in Cherai Beach. Free private parking is available on site. Certain accommodations feature a sitting area where you can relax. A flat-screen TV with cable channels is provided. You will find a 24-hour front desk at the property. The area is popular for fishing and canoeing. The resort also provides bike rental and car rental. Cochin is 13 miles from Kadalkkara Lake Resort, and Ernakulam is 13 miles away. Kochi International Airport is 14 miles from the property. Kadalkkara Lake Resort is like staying in a rare, dreamy, and green paradise. Each day you'll wake up to the beautiful scenery of fishermen in canoe's with an exotic atmosphere in the backdrop. A trip to this village resort, away from the hustle and bustle of the city crowds will bring peace of mind in a meditation mood. Breakfast isincluded for free with your stay.